Exploring previously uncharted sonic territories, The Cargo Cult’s Envy is a pitch and modulation plug‑in designed to apply the characteristics of one sound to another. Envy analyses the dynamics, envelope and pitch of Sound Aand allows the user to then tailor them and apply them to Sound B. Those who work mainly in music may not have heard of The Cargo Cult, but their plug‑ins are indispensable to many who work in post‑production, and Envy will interest anyone in the business of mangling, bending, warping or completely redefining sounds. Being an offline Audiosuite plug‑in, Envy is available only to Pro Tools users. It is currently supported under Mac OS 10.8 or greater, though The Cargo Cult are working on a Windows release. Envy’s layout is clean and straightforward, presenting three envelope modules: pitch, spectral and amplitude. These envelopes are derived from a waveform that is analysed and displayed at the top of the plug‑in, but the twist here is that the pitch, spectral and amplitude information is then applied to another sound source. So, for example, you could apply the pitch and envelope characteristics of human speech to the sound of a walrus bellowing to create a growling monster voice. Equally, in a musical context you could apply the rhythm of a hi‑hat to the sound of ocean waves. Sounds that were previously mismatched can now be processed to feel like one source, and old sample libraries can be reinvigorated by imprinting the fingerprint of old sounds onto new ones. All of the parameters are straightforward, so the learning curve is quite bearable in most respects, but the basic concept of Envy is so foreign that it takes a bit of practice to learn what sort of results to expect. I found the outcomes were often surprisingly usable, and that with more use, I would have been able to predict the outcome even better. 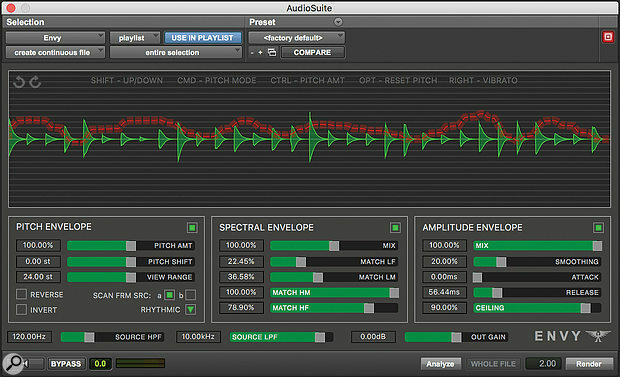 Pitch envelope data is imported during the Audiosuite analysis and displayed as a red line atop the analysed waveform. You can select one of two pitch‑detection modes, which offer slightly different results in terms of pitch‑tracking; it’s also possible to freely draw the pitch curve and introduce vibrato. The strength with which the pitch curve is applied to the effected sound can be adjusted, and the pitch‑shifter allows for up to 24 semitones of adjustment in either direction. There’s also a choice of pitch‑shifting algorithms: Varispeed acts like tape varispeed, retiming the effected sound relative to the pitch being applied, the others keep the original timing information. Smooth has the fewest artifacts, Rhythmic is designed to preserve transients, while Bad and Worse are deliberately lo‑fi. Envy provides undo and redo buttons, and also responds to the standard keyboard shortcuts as well as additional keyboard shortcuts for other pitch parameters. The quality of the pitch‑shifting is quite good, so as well as creating special effects, Envy can also help with corrective work such as aligning the pitch of ADR or alternate takes to that of an original take. The second module houses the spectral envelope, which separates the analysed signal into four frequency bands and allows you to specify how closely the envelope of each band should be imposed on Sound B. There is no visual feedback for this process, which takes a bit of practice to understand, but it is incredibly useful for both creative inspiration and finessing the final result. At the core of Envy’s capabilities, though, is the amplitude envelope module. Again, this is derived from the analysed signal, but can be adjusted using the attack and release controls to influence the snappiness of transients and the length of decays. This can force swells or long releases on otherwise staccato sounds. The degree to which the envelope gets applied to the new sound is defined by the mix control, while the smoothing determines how closely Envy follows the contours of the original sound’s envelope. Finally, the ceiling control limits the amount of additional gain applied to the processed sound, helping mitigate artifacts when there are large gain inconsistencies between the source and the destination sounds. As I started to better understand what Envy could achieve, I found myself unexpectedly relying on it. On a documentary, I took distorted, gusting winds and applied them to bigger, more dramatic winds, while still hitting all the same cues and cadences without any editing needed. In a drama, the sound of falling leaves melded with the swirling of water to create a surreal texture. In a sports promo, the sudden surge of one small crowd was applied to a stadium of cheers. Inspired to try Envy on music, I turned the sound of air pushing through a vent into an interesting percussive loop, and used a cello to underline a vocal, following the singer’s cadence, phrasing and intensity. It sounds trite to say the possibilities are endless, but they really are! Envy is rounded out with high‑ and low‑pass filters that can be applied to the original source, as well as an adjustable output gain. The addition of a gate to filter out the analysed sound by volume would have been a nice addition — there were a few times where I only wanted to use the envelopes of loudest parts of a source, for instance for extracting kick bleed in a snare track, or capturing a voice without breaths. This is by no means a deal‑breaker, and you can always apply a gate to the original file before analysis, but it would have been a helpful feature. Otherwise, I am hard‑pressed to find faults with Envy. It’s full of what‑ifs waiting to be answered, and manages to walk a fine line between being utterly indispensable in its usefulness and outlandish enough to inspire the bizarre and incomprehensible. I strongly suggest watching The Cargo Cult’s informative videos and download the trial, if only to understand this new class of plug‑in. I suspect that you will be as amazed as I am.